Dean Locks No 90 is a minor waterways place minor waterways place place on the waterways major waterways place village town city on the Leeds and Liverpool Canal (Main Line - Liverpool to Wigan) between Appley Bridge No 42 (Canalside hamlet) (1 mile and 4¾ furlongs to the northwest) and Crooke Bridge No 47 (Crooke) (1 mile and ½ furlongs to the east). 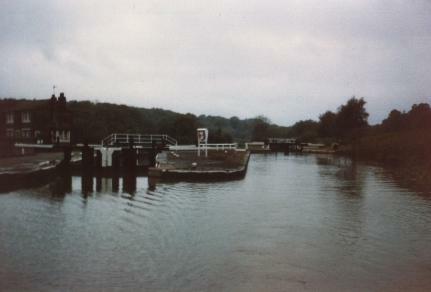 The nearest place in the direction of Appley Bridge No 42 is Winding Hole below Dean Locks (End of Leigh&apos;s Cut and site of former lock to River Douglas); ¼ furlongs away. The nearest place in the direction of Crooke Bridge No 47 is M6 Douglas Valley Viaduct; ½ furlongs away. Mooring here is good (a nice place to moor) , mooring rings or bollards are available. Mooring in the disused lock arm is ok, and the motorway is not too noisy. No vehicle access to the mooring. Indian Restaurant 1/4 mile away, Station pub is ok (no real ale) further up the hill. Good access to train station. Information last edited Saturday the 31st of March, 2018 at 4:55 PM by Shultzy. Broad O'th Lane, Shevington, WN6 8EA — 1480 yards to the northeast. 1 Miles Lane, Shevington, WN6 8EB — 1487 yards to the northeast. Shevington — 1120 yards to the northeast. Wigan — 1502 yards to the northeast. Wigan, WA3 3TA — 1538 yards to the southeast. Gathurst Road, Wigan, WN68JB — 491 yards to the east. Miles Lane, Shevington, Wigan, WN6 8EB — 1434 yards to the north. St Anne’s Parish Centre, Shevington, WN6 8BD — 1165 yards to the northeast. Springfiels, Wigan, WN6 7 — 1538 yards to the southeast. Jubilee House 5 Broad O'th Lane, Shevington, WN6 8EA — 1505 yards to the northeast. 2b Gathurst Lane, Shevington, Wigan, WN6 8HA — 1331 yards to the northeast. Dean Locks, Gathurst Lane, Shevington, Wigan, WN6 8JD — 65 yards to the west. Wigan — 1229 yards to the north. shevington, Wigan, WN6 8 — 1329 yards to the northeast. Wigan — 1421 yards to the northeast. Wigan — 1106 yards to the northeast. 162 Gathurst Lane, Wigan, WN6 8HZ — 550 yards to the east. spring rd, Wigan, WN50JJ — 1538 yards to the southeast. Shevington, Wigan, WN6 8BD — 1421 yards to the northeast. Shevington, Wigan — 1421 yards to the northeast. Shevington — 1520 yards to the northeast. st annes drive, Wigan, WN68HQ — 1165 yards to the northeast. Shevington, Wigan, WN68 — 1434 yards to the north. Wigan — 1544 yards to the northeast. Gathurst Lane, Shevington, WN6 8HA — 1423 yards to the northeast. Shevington, Wigan, WN6 8HF — 1390 yards to the northeast. Shevington, Wigan, WN68ER — 1421 yards to the northeast. 22 Woodlands Drive, Wigan, WN6 8HU — 668 yards to the northeast. Ardene, Bank Brow, Appley Bridge, WN8 0SY — 1629 yards to the northwest. Gathurst Rd, Wigan, WN5 0 — 934 yards to the south. Shevington, Wigan, WN6 8EB — 1371 yards to the north. Wigan — 1429 yards to the northeast. Wigan — 1352 yards to the northeast. 2E Gathurst Lane Shevington, Wigan, WN6 8HA — 1198 yards to the northeast. woodview, shevington, wigan, Wigan, WN6 8BG — 1588 yards to the northeast. Shevington — 1527 yards to the northeast. Houghton Lane, Shevington, Wigan, WN6 8ET — 1251 yards to the north.